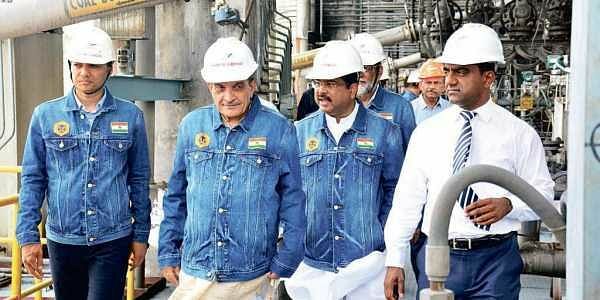 ANGUL: Union Minister for Steel Chaudhary Birender Singh on Saturday said the innovative coal gasification process created by Jindal Steel and Power Limited (JSPL) for making steel for the first time in the world will help Odisha becoming a steel hub. The Union Minister dedicated manufacturing units to the nation on the day. Those are country’s largest 4554 m3 Blast Furnace (BF), a 3 MTPA Basic Oxygen Furnace (BOF), world’s first and largest Syngas-based 2 MTPA DRI plant and world’s largest Coal Gasification Plant (CGP) for steel-making based on Swadeshi Coal. About 80 per cent of coking coal worth `20,000 crore is imported by India. “We remain dependent on imports (for coking coal) but Naveen Jindal has come out with a plan which can make us reduce this dependence,” he said. The Minister added that the new technology of making steel by coal gasification helps in producing the metal using domestic coal.Inaugurating the key steel manufacturing facilities Union Minister for Petroleum and Natural Gas Dharmendra Pradhan said, “The steel industry is going to be a major contributor in employment generation in coming days. On the occasion JSPL Chairman Naveen Jindal said, “This is for the first time that any company in India is using coal gasification method to make steel. We are hopeful that after one year we will be able to run the Angul plant in full capacity”. The Greenfield complex was initially conceived as India’s first and only steel plant to operate on purely swadeshi raw material. Over time, the Angul steel plant has transformed into India’s most resilient steel-manufacturing destination, deploying a judicious mix of oxygen and electric steel-making routes.